The AVM Wolf vertical self-propelled T.M.R feed-mixer series offers high reliability thanks to the innovative vertical augers able to express their full potential, simplicity and reliability. 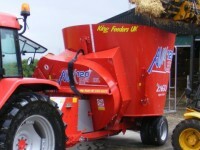 Specifically designed for medium-small sized farms. The AVM Wolf adopts the perfected vertical feed-mixer system that provides faster mix preparation times. The chassis, mounted on sturdy trestle sections is equipped with a 4-sensor weighing system. The reduced axle base provides easy manageability even in tight passages. The miller cutter, 200cm wide, guarantees high performance and maximum load speed in both rotation directions thanks to the 70cm wide manifold. The two 95kW piston motors allow flour, long fibres, grass silage, straw and various other silage to be loaded, maintaining their integrity. Available with various drives from 129kW, 6 cylinders stage IIIA: Iveco, John Deere, Deutz, Perkins. Significantly large self-cleaning radiators and highly accessible technical compartments make maintenance easy. Mechanical auger transmission reduces power absorption, guaranteeing low consumption and minimum maintenance costs. Hydrostatic transmission drive with two gear motors on the rear wheels. 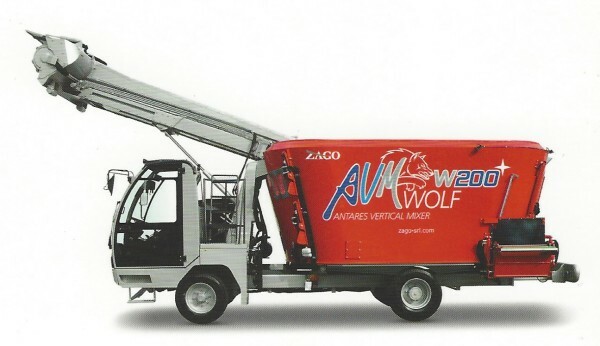 The AVM Wolf series is available in 15,17,20,22,26 and 30 cubic metres.